Home Companies NANJING NTRIC ELECTRONICS CO., LTD.
XLR connectors are available from a number of manufacturers and are covered by an international standard for dimensions, IEC 61076-2-103. They are superficially similar to the smaller DIN connector range, but are not physically compatible with them.XLR connectors are available in male and female versions in both cable and chassis mounting designs, a total of four styles. This is slightly unusual as many other connector designs omit one of the styles (typically a chassis mounting male connector). 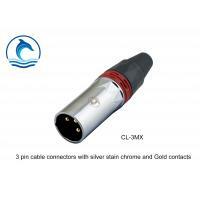 The CZXYON 3 pin connectors adopts the purest material and precise workmanship, ensures lifelike acoustic experience for the audiophiles. 1. Gold/Nickle plated contact - ensures lowest tansmission resistance. 3. Ideal to DIY interconnection cables for your microphone and loudspeaker. all parts comply with SGS, ROHS, CE, CERTIFICATED. a. Before producing, all of our cable raw material must be delected by our quality inspectors, and make sure 100% passed. b. During producing, we have professional assembly line to make the produce more specialty, careful and humanization. c. After finishing production, our quality inspectors will use our professional machine to test the Original material one by one, only 100% passed, we will package them in standard export carton box. d. Before shipping, our delivery staffs will pick some samples in random, and test the sample again. Only the 100% passed, we will send the products to our customers. We sell products of our own "CZXYON" brand, providing fast deliveries. We also accept OEM orders, producing according to your design, logol and package solutions. Q1. Are you a manufcturer or trading company? A: We are a professional manufacturer of all kinds of cables, wires, connectors and a series of connective accessories. Q2. How long have you been engaged in this industry? A: Our company was established in 2008. And we start the OEM business since 2011. Q3. Do you have your own brand? A:Yes. We own the brand "CZXYON", which is the famous brand in China and also highly commented in the international market. Q4. Which kind of channel do you specialize in? A: In the past two decades, we've paid more attention on the off-line business. Our oversea marketing department would travel serveral times to attend international trade fairs all over the world. That's why "CZXYON" is also known by the international market. A: - For OEM business, the MOQ depands on types of products.Please contact us. - For "CZXYON" products, online wholesale is available (no strict limitation for the order quantity). Q6. How long the lead time will be? A: - For OEM business, we need about 30 working days for production after the sample is confirmed. - For "CZXYON" products, if we have sufficient stock, we can ship the goods in 2 working days after payment confirmed. Otherwise, we need about 20 working days to get the goods ready.